Everything Coastal....: Oregon Coast Therapy Animals - My friend Susie! Oregon Coast Therapy Animals - My friend Susie! 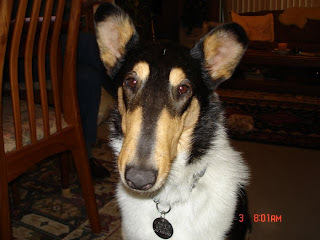 Susie is a Smooth Collie and owns two humans...Michael and Patti Frazier. One of her humans' saw a piece in the local paper, last spring about the Oregon Coast Therapy Animal program. All that was required was a little written test, a performance review and Susie could be registered as an official Pet Partner with the Delta Society and OCTA (Oregon Coast Therapy Animals). Then, she and her humans would be welcome visitors to many places that need that special understanding that only animals can provide. The written test was a breeze but Patti messed up on the performance evaluation. Susie and the humans had to take the tests again last summer and luckily, they all passed, that time. Susie likes all people; big, tall, short and small, all animals; feathered, tailed, clawed and beaked and seems to know when they are; scared, sad, mad or freaked. Susie knows who needs a satin glove and she finds a way to show them love. Her gentle patience is what makes her special and she has touched many since she became a Therapy Dog. Susie has visited a homeless shelter and a couple of assisted living homes. She enjoys the people and the attention they give her. The OCTA Society helps many in our coastal community, including the hospital, the jail, they are requested at times for Grand Jury help with children, the library, schools, nursing and assisted living homes, along with homeless shelters and women's shelters. Now, since Susie is so loving, and loves all living things, this can be an issue for her humans. One day, Patti was calling for her to come in the house from the front yard. Susie, stood still as a statue, nose almost to the ground and ignored Patti. Patti called her again, this time taking a couple steps from the front door to see what Susie was doing. Just as Patti stepped toward Susie, the mole that was to become Susie's new best friend, ran away into the shrubs. Susie was not happy about the loss of her new friend. Susie has many stories like this one, so Michael wrote and sang a song about her. Hope you enjoy it! Caron, therapy dogs came to visit us in the hospital and at Ronald McDonald House. They are so helpful for sick children! When you are far away from home, and unable to be with your own pets, therapy dogs can be powerfully good "medicine." Thank you for sharing about this! I hope it inspires others, too.